Posted on Monday, September 28th, 2009 at 9:10 am. The church is a voluntary society, a ‘community of volunteers’, if you like. Without volunteers almost everything we do would grind to a halt. All those rosters and committees and leadership of groups and ministries would cease. Most parachurch organisations live or die on the strength of their volunteer base. But we live in times when the pressure on the time and energy of volunteers has never been greater. In most families both parents are working outside the home and most people are working longer hours. The pace of modern life seems to have quickened and many people complain of ‘time compression’. One of the ways this is showing up is in the church attendance patterns of committed people. Ministers everywhere are reporting less regular attendance and a reluctance to commit to long-term tasks. So the recruitment, motivation and sustaining of volunteers is of critical importance for Christian leaders. We need to understand better and care more thoughtfully for our volunteers. Volunteers and volunteerism are important because volunteers don’t just spread the load or act as ‘labourers’ for paid staff – they multiply ministry. The key to multiplying ministry is to multiply ‘the ministers’ and the most economic way of doing that is to multiply volunteers. When people use their gifts and abilities, three things happen – the ministry grows, they grow and the Kingdom grows. Volunteers give their time and energy out of choice. In a real sense it ‘costs them’ to be involved. Why do they do it? What motivates them? Why do people choose to volunteer? The answer to these questions gives us clues in how to develop and encourage volunteers. The call or claim of something higher – the vision of a cause or an important task. A ‘calling’ to minister to others, the desire to make a difference and change things for the better, a desire to give something back, an inspiring leader with an inspiring cause. Relationships, belonging, community – the rewards of friendship, being part of a team or group. Personal needs – a meaning for my life, a sense of significance and identity, a way to develop or use my gifts and abilities, to fulfil a sense of duty. There are, of course, less noble desires in all of us: the need to assuage guilt, to feed self-importance and the desire for power and influence. Leaders should acknowledge the sacrifices volunteers make and seek to strengthen the best areas of motivation – vision, making a difference, being part of a team, doing something significant. Create teams and build communities among volunteers, have fun together, eat together. Keep the vision behind the task bright. Affirm, encourage, praise, recognise the cost. Show personal interest and support. Where appropriate, commission them publicly. See they have the resources they need. Give them a clear, simple, written job description. Give them training, equip them. Empower them, give them real responsibility and participation in decision-making. Meet with them regularly to encourage and supervise them and to evaluate the task, but don’t overburden them with meetings. Sign them up for specific time lengths. Resolve conflict when it arises. Volunteers drop out or burn out because of the opposites of the fourteen clues above! Volunteers can be the basis for building staff teams. Invite people to join the staff as ‘tentmakers’ or bi-vocational workers. These are people who choose to work part-time in another job and give their time free to the church. Young adults between school and work or university, or post-university, who have minimal financial responsibilities can be encouraged to give two or three days a week as unpaid staff persons in return for some training and work experience. This can also be an excellent way to explore suitability for future full-time ministry. Care should be taken to first talk through all the implications of this with young people and then to monitor their progress carefully. 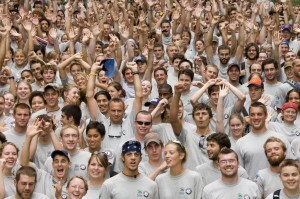 During the Sydney Olympics approximately 45,000 people volunteered for a huge range of tasks. The experience for the overwhelming majority was very rewarding, positive and exciting. These people felt they were doing something really worthwhile, they felt caught up in a cause bigger than themselves, they were also proud to be Australians and to give a warm welcome to the thousands of visitors. It is now widely acknowledged that their contribution was a key element in the Games’ success. We are part of a cause that is so much more important and so much bigger than the Olympics (Hebrews 12:1-2). If Christian leaders can convey a Kingdom vision to their members, people will respond and their lives will be deeply enriched.